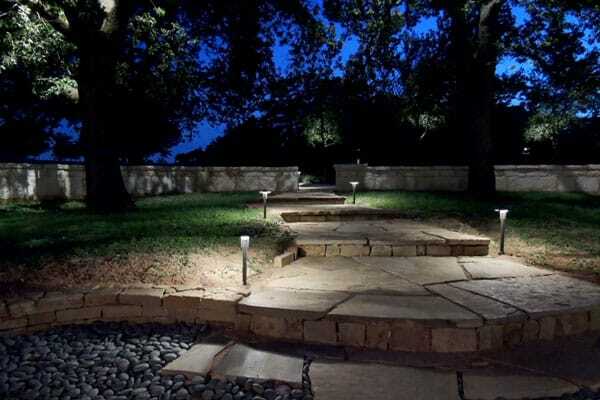 LED lighting for outdoor use is becoming a top choice among homeowners in the Dallas-Fort Worth area. This type of lighting offers an environmentally friendly way to add aesthetic appeal and improve safety in outdoor areas, such as gardens and patios. At Creative Nightscapes, we’re committed to helping homeowners in the greater DFW area find the most suitable LED lighting for home exteriors and landscaping. Knowing more about this kind of lighting can give you a head start when it comes to going over your options. Our team is here to guide you through the design process and help you choose LED lights that will flatter your home and increase its curb appeal. When you want to lower the amount of voltage needed for outdoor lighting and use less energy overall, the ideal option is low voltage LED landscape lighting. This kind of lighting only needs 12 volts of electricity, which is considerably lower than more standard 120-volt or 110-volt circuits. The use of LED bulbs in low voltage landscape lights requires a significantly smaller amount of energy, resulting in a more eco-friendly lighting option and a decrease in utility costs. These lights are available in a wide range of designs and types, providing you with plenty of options for outdoor lighting. The professional lighting experts at Creative Nightscapes can assist you with selecting and designing your outdoor lighting. Our experts also adhere to strict safety guidelines to ensure that low voltage lights and transformers are installed correctly so that you have a lower risk of encountering problems with your lighting. Our low voltage LED lights are excellent options for illuminating garden areas, providing security, or drawing attention to specific features on your home’s exterior. We can help you find the right lighting solution for your DFW home so that you can enjoy the advantages of low voltage LED lights. Going with LED exterior lighting for your home comes with notable benefits. LED bulbs use less energy than halogen, incandescent, and other types of bulbs. This leads to a more eco-friendly lighting option that also saves you a considerable amount of money on the cost of lighting your home’s exterior. Using less energy-efficient bulbs results in a higher amount of electricity used each night, which means you end up paying higher energy bills. LED exterior lights also save you money concerning bulb replacement. Since these bulbs can last for about ten years before needing to be replaced, you won’t be spending as much money on bulbs after investing in this type of outdoor lighting. LED lighting for home exteriors is also safer because these bulbs do not generate as much heat as incandescent bulbs. This results in a lower risk of fires and damage to bushes and other vegetation that are close to these bulbs. Since LED bulbs can be placed near these garden and landscape elements, they’re also more versatile when it comes to design options. LED lighting gives you a visually appealing way to light up your DFW home’s exterior. These bulbs, especially warm white ones, tend to produce a more pleasing tone that is soothing to the eye. Spotlights provide homes in the DFW area with added security, along with creating an eye-catching effect that can enhance home exteriors. Using outdoor LED spotlights is an eco-friendly way to keep your property safe while boosting its appearance. The bulbs in these spotlights are made to last for several years, so you don’t have to worry about changing them often or having them burn out frequently. LED spotlights are a more dependable way to deter intruders and ensure that your home exterior, garden, and other outdoor areas have plenty of lighting. At Creative Nightscapes, we understand the importance of choosing the most suitable outdoor LED spotlights for your home. Going with the wrong kind, such as lighting that’s too harsh, can give your home an unflattering appearance. Our experts will ensure that your LED spotlights are the right type for your property. We’ll also choose the best places to put these spotlights so that you won’t have glare or not enough light in certain areas. You can rely on the lighting experts at Creative Nightscapes to give you valuable assistance in choosing LED spotlights. 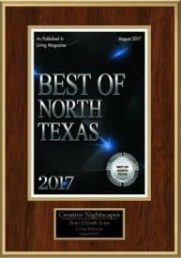 If you’re considering having LED outdoor lighting installed for your home in Dallas or Fort Worth, please contact Creative Nightscapes today. Our experts will provide you with a complimentary quote and help you set up a consultation at your home. Based on your personal preferences and the layout and features of your property, we’ll help you come up with the ideal LED lights to brighten your home in an eco-friendly way.